We need your help in safeguarding the future of RHS Garden Wisley and the local area from Highways England's proposed A3 plans. Find out more about our response to Highways England's preferred option to widen the A3 and how it will affect RHS Garden Wisley. In September we raised a petition inviting everyone to help us save RHS Garden Wisley in the face of the threatened road development. The petition has now been closed. Thank you for all your support. We were astounded to reach more than 134,000 signatures of support just seven weeks after the petition was launched. The petition is a powerful statement on the importance of RHS Garden Wisley and the difference it makes not just to people in the local community, but also the national relevance of the garden and the future of horticulture. We will be sharing the results of the petition with the Department of Transport and Highways England to ensure that your views are taken into consideration on this crucial matter. One of of the UK’s most loved and horticulturally important gardens is under threat from Highways England plans to widen the A3 in what could be the ultimate garden grab. 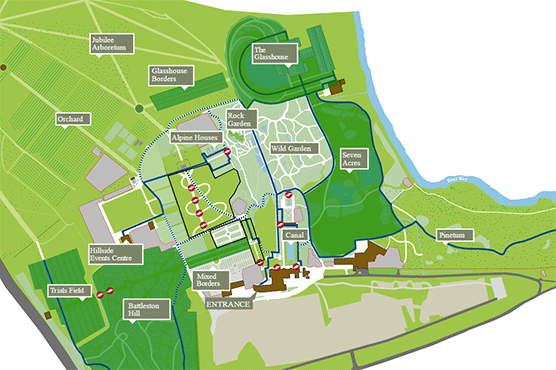 RHS Garden Wisley, a Grade II* listed garden, could have more than 10,000 sq. metres of woodland grabbed and more than 500 trees destroyed, including one planted by The Queen to mark her Silver Jubilee, if one of Highways England’s plans is developed. The RHS estimates that the 500 threatened trees help to negate the emissions of 19,000 cars each year*. There are currently two options available to Highways England to widen the A3: one on the east side of the A3 and one on the west. The RHS has carried out expert highway studies and is calling on the Government Agency to choose the east option which does not grab woodland from the garden, would not fell any of these important trees and would better improve road access to Wisley**, which welcomes 1.2 million visitors a year. Irreplaceable historic trees that are more than 100 years old and have centuries more to live, could be eliminated for a short-sighted road improvement scheme which would increase air pollution and destroy the habitats of a wide range of wildlife. Losing this beautiful 30m (100ft) natural barrier of trees on Wisley’s boundary would be visually devastating and could also increase noise pollution, which would impact negatively on the enjoyment of the garden as a peaceful place to escape, relax and be inspired. In principal the RHS supports plans to make improvements to the M25 Junction 10/A3 Wisley interchange. Our concern is that of the two options being put forward by Highways England to improve Junction 10, both would involve widening the A3 and could take land from the garden. We don’t object to either option, our main concern is the consequential widening of the A3 and the potential impact this could have on Wisley. The RHS has had expert highway studies carried out and has come up with a viable option, which would allow widening of the A3 on the east side and would not destroy the woodland protecting the garden. In addition, a new route from the east, with other modifications, would allow greater accessibility now and in the future for our 1.2 million visitors. There is also concern that some proposals for the A3 would involve additional travel for visitors to get to Wisley, some adding more than 3.7 miles to the journey, which is unacceptable. The garden needs to be as accessible as possible for everyone, especially with major RHS investment to make the garden better than ever before and to welcome more visitors. Therefore more direct access to and from the A3 to Wisley is vital and must surely be a key consideration for Highways England as well. ‘The Queen’s Tree’, planted by the RHS’ Patron Queen Elizabeth II to mark her Silver Jubilee. Five trees identified as threatened and endangered in cultivation by Plant Heritage’s Threatened Plants Project, including a Norway maple (Acer platanoides ‘Olmsted’), a beech (Fagus sylvatica ‘Quercifolia’), two hollies (Ilex ‘John T. Morris’ and Ilex aquifolium ‘Frogmore Silver’) and a lime tree (Tilia americana ‘Redmond’). Excellent specimens of giant redwood (Sequoiadendron giganteum) would also be at risk. Their loss would compromise the designed landscape of Wisley, as well as altering the skyline of the Surrey landscape. Alan Titchmarsh, RHS Ambassador, says: 'This potential garden grabbing plan would be another unacceptable example of this government’s poor perception of horticulture and lack of appreciation of the vital role that plants play for the environment, for the nation’s health and wellbeing and for the UK economy. 'Wisley is the UK’s centre of excellence for horticulture and horticultural science and helps millions of people to garden and grow plants. Sue Biggs, RHS Director General, says: 'It would be criminal for this irreplaceable woodland to be lost when another viable plan would avoid cutting down these century-old trees and still meet the important need to widen the A3. 'We’re currently investing over £70 million into RHS Garden Wisley in horticulture, new laboratories, learning buildings and visitor facilities, making the garden an even more important centre for science, and a better place to visit. * The RHS estimated the emissions that the 500 trees help to negate by using a modelling study by Tiwary et al. (2009), which calculates PM (particulate matter) pollution sequestration by a 10 x 10 km grid of vegetation, therefore the Wisley patch could remove 900 kg of PM per year. This would negate the emissions by 19,000 cars (assuming maximal emission of 0.005g/km and 12,000 km annually per car). **Highways England have undertaken in Public Consultation to ‘Improve access to Wisley Garden'. The RHS has consulted closely with HE to register concerns about the garden’s long term viability, including planned upgrades of the M25 J10-16 in the future. Wisley deserves ‘the right answer’ after previous M25 and A3 schemes over the last 30 years have sliced through its land. We're investing more than £70 million into RHS Garden Wisley. Learn about the exciting work under way at our flagship garden.